A few weeks ago I received an email. Did I know about the Sternberg Mansion in Wichita, Kansas? So I clicked on the Realtor.com listing, and my heart was instantly seized. Before me was a FABULOUS house built in 1886. But, before me was also a house in alarming condition. I am a sucker for a damsel in distress. The listing offered scant information or images, so I knew I had to call my realtor. Not much to look at in this image, but WAY cool in person. Fabulous stepped stone entrance, and behind the terrible new screen door is the wood front door with a huge round glass window. The house had some significant structural issues, and after much thought I decided to pass on it. For, I was wildly busy and knew I would have zero time for a fixer-upper. So, what did I do a year later? I purchased a massive house needing a billion times more work. Well, love does strange things to people. After all this, I figured that my realtor knew I was a nut case, but he still seemed to like me anyway. God bless ’em. So, when I wanted to look at the Sternberg Mansion, I contacted him. Even though I made it clear that I did NOT want to buy the house, my realtor nonetheless graciously agreed to give me grand tour. I also took him to lunch. Ominously, I had to sign a waiver to even see the house: DUE TO THE POTENTIALLY UNSOUND NATURE OF THE STRUCTURE, SELLER REQUIRES THAT ANY PERSON OR PERSONS ENTERING THE PROPERTY IS(ARE) AT THEIR OWN RISK AND MUST PROVIDE A SIGNED HOLD HARMLESS AGREEMENT TO LISTING AGENT PRIOR TO SCHEDULING SHOWING AND/OR ACCESSING THE PROPERTY. Wichita had its boom years in the 1870s and 1880s. A prolific builder was William Henry Sternberg. In 1886, he designed and built his own home at 1065 North Waco in Wichita. The residence of Mr. Sternberg, a handsome and costly structure, is beautifully located on a rise of ground commanding a fine view of its surroundings. Within and without it bears the evidence of refined tastes and ample means, and it is universally admired by all who have occasion to pass it. In short, Sternberg built a giant calling card to show his capabilities. Behind the house was the carriage house. I love the chimneys LEAPING into the air. 2015. Amazingly, most of what was there in 1886 is still there in 2015. Except, one chimney. When it was being taken down for a rebuild, it collapsed. My realtor and I pulled into the rear driveway. It abuts an old, nondescript house. I thought it would be nice to buy the small old house, knock it down, and create a nice garden. Then, while researching this post, I learned that the small house is the original carriage house! Suddenly, my estimation of its worth hugely increased! The mansion shown on a Sanborn map, upper left. The house retains four lots, 926 through 932. None of the surrounding structures are extant. The south entrance. The main entrance is east, and there is also a north entrance. While everything looks terribly shabby, this reflects the remains of a paint job from the 1970s rather than rot. See, most everything is, amazingly, intact. And yum! Big yum! The exterior, while not without its issues, thrills me. The roof is also brand new. 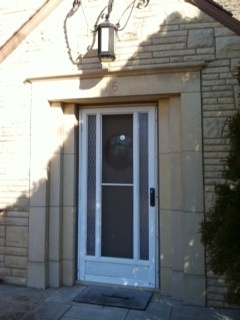 The pair of wood front doors, with a stained-glass transom, were replaced by a single door and a wide side light. The dining room had high wood wainscoting installed, and a heavy beamed ceiling. During the ensuing decades, the once-prime neighborhood declined, and the house was turned into apartments, Later, it became a care facility. By 1969, the house had lost its porches, was covered in “brick” asphalt siding, and was in perilous condition. In the early 1970s, the house was purchased by the newly formed Urban Redevelopment Agency (URA) for $11,200, which then spent $55,000 to restore the exterior. This would explain why so much is intact today. I am uncertain if the porches are wholly 1970s recreations, or restored from some original components. The derelict interior was left untouched, save for removing the many apartment partitions. 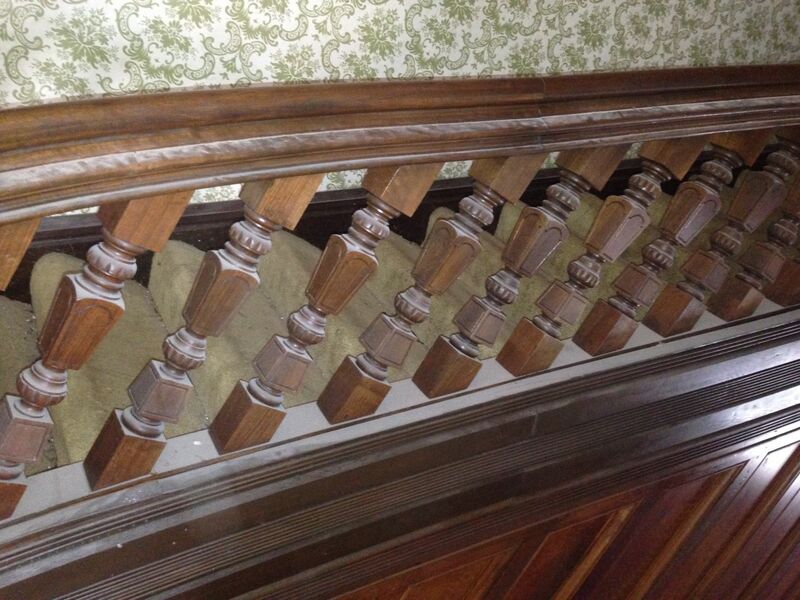 During the restoration, the house was broken into, and thieves stole the prairie-style stained glass stair windows, the newel post for the main stair, mantles, and other components. 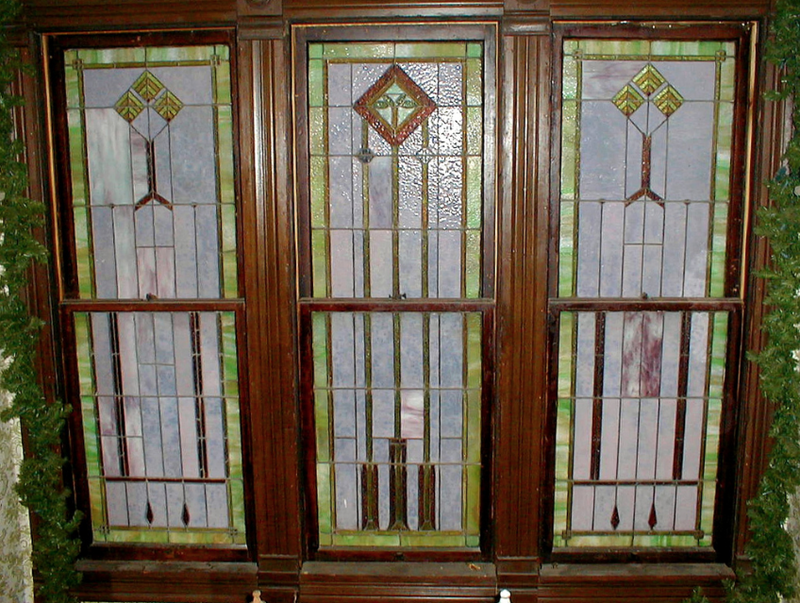 The stained-glass windows were recovered four months later, and returned to the house. 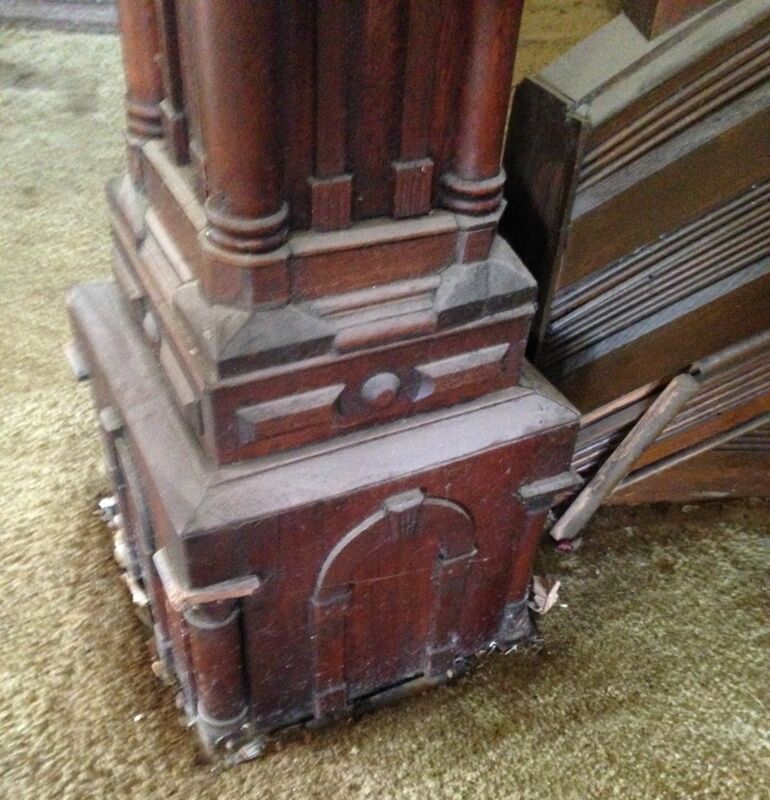 The newel post was also recovered (although the newel currently in the house is not original). 1975: URA opened the house for a public tour. 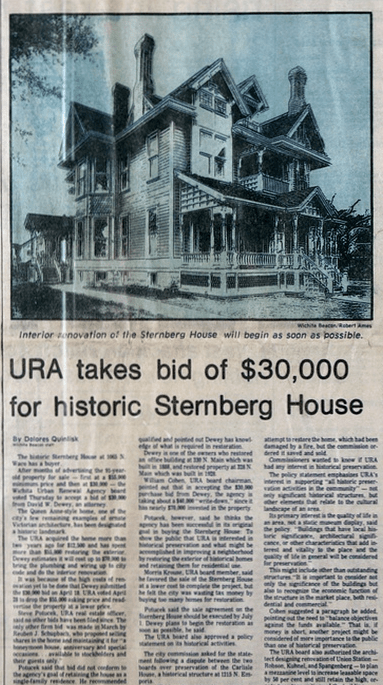 1976: URA tried to sell the house. 1977: URA sold the house for $30,000 (a considerable loss to URA) to David and Sally Dewey. The couple renovated and restored the interior. 1987: The Dewey’s listed the house for $295,000. 1998: The Dewey’s sold the house to Hazel and Jim Craig. 2009: Amazingly, after all this effort to bring the house back to life, it was threatened with demolition by the city due to dangerous chimneys and foundation issues. To save it from this fate, the house was purchased by Ken Elliot. 2010: The house was listed as one of the “Most Endangered Historic Property in Kansas” by the Kansas Preservation Alliance. 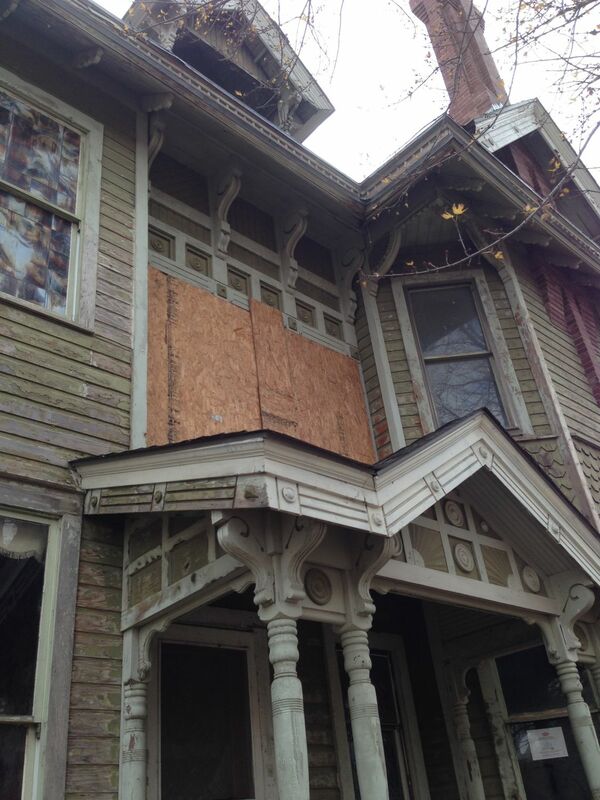 2011: Elliot received two grants to help stabilize the house. 2015: After a new roof was installed, and significant foundation work completed, and one chimney rebuilt, the house was listed for sale. The current ask is $59K. The exterior is shabby but actually in good condition. The interior is derelict. 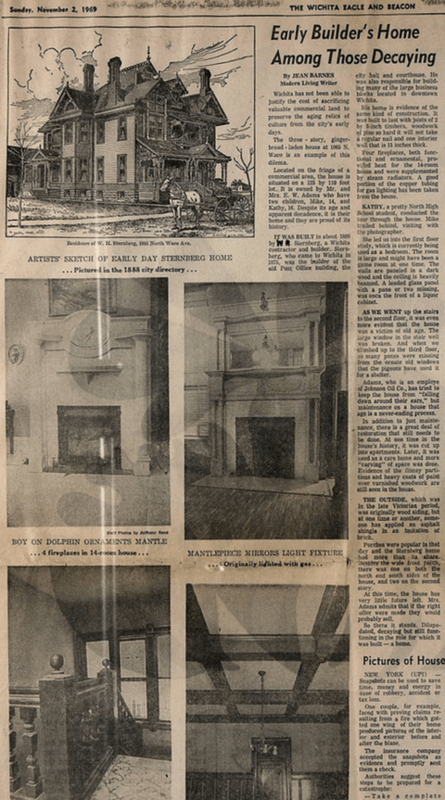 An article from 1969 shows the interior intact. Note the “dolphin” mantle, upper left. Wichita had not been able to justify the cost of sacrificing valuable commercial land to preserve the aging relics of culture from the city’s early days. 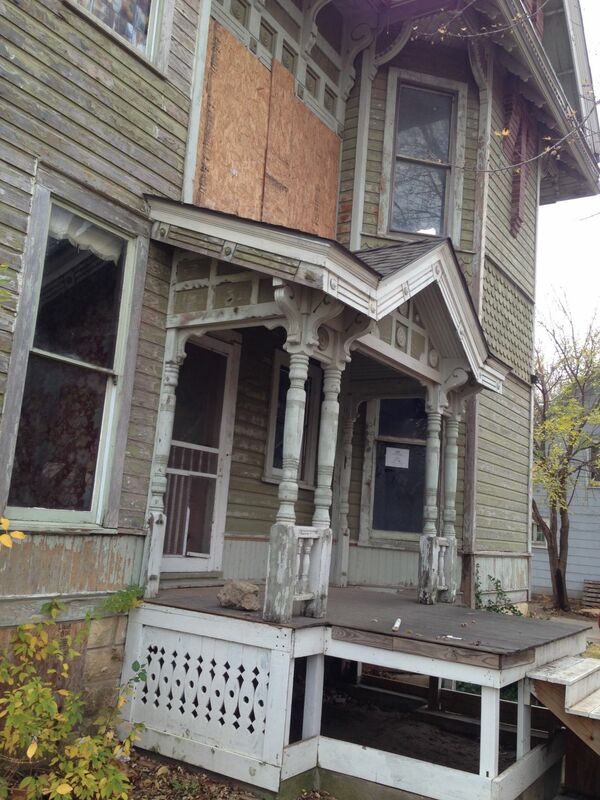 The three-story, gingerbread-laden house at 1065 N. Waco is an example of this dilemma. Located on the fringe of a commercial area, the house is situated on a 125 by 110 foot lot. It is owned by Mr. an Mrs. E. W. Adams who have two children, Mike, 14, and Kathy, 16. Despite its age and apparent decadence, it is their home and they are proud of its history. 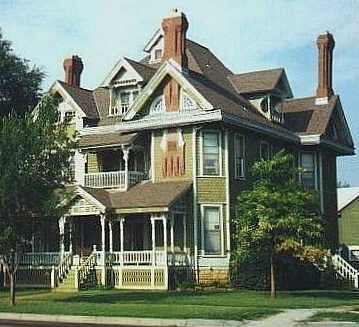 It was built in about 1880 by E. W. Sternberg, a Wichita contractor and builder. Sternberg, who came to Wichita in 1875, was the builder of the old Post Office building, the city hall and courthouse. He was also responsible for building many of the large business blocks located in downtown Wichita. His home is evidence of the same kind of construction. It was built to last with joists of 2 by 8-inch timbers, woodwork of pine so hard it will not take a regular nail and one interior wall that is 15 inches thick. 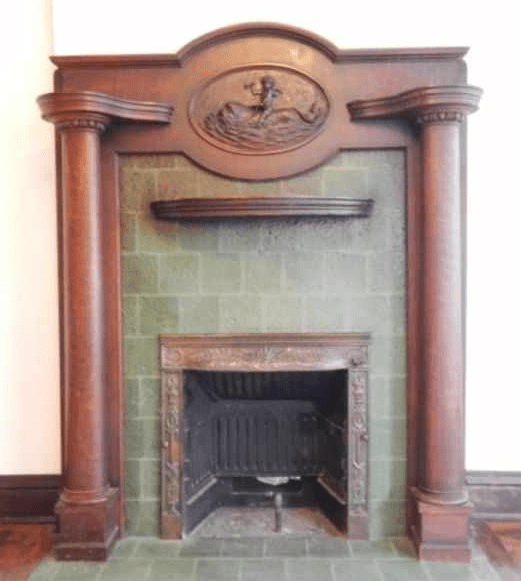 Four fireplaces, both functional and ornamental, provided heat for the 14-room house and were supplemented by steam radiators. A good portion of the copper tubing for gas lighting has been taken from the house. Kathy, a pretty North High School student, conducted the tour through the house. Mike trailed behind, visiting with the photographer. She led us into the first floor study, which is currently being used as a bedroom. The room is large and might have been a game room at one time. The walls are paneled in a dark wood and the ceiling is heavily beamed. 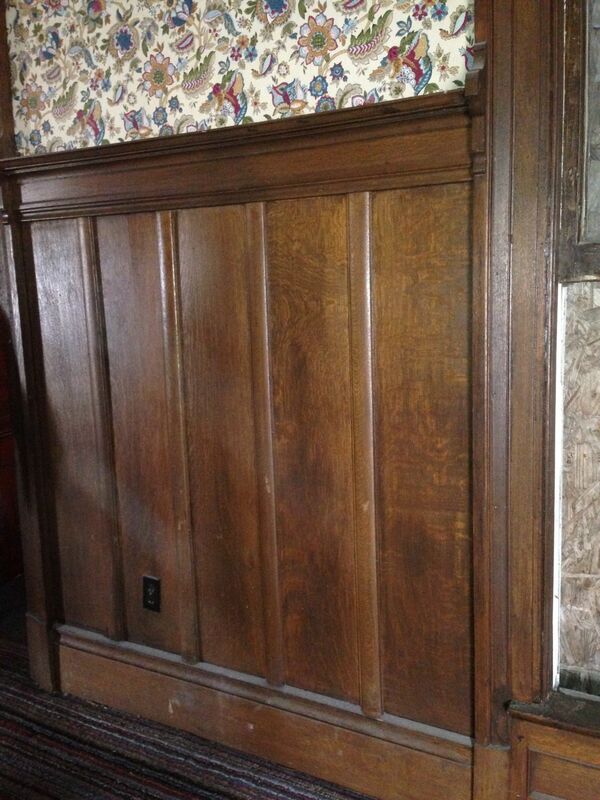 A leaded glass panel with a pane or two missing, was once the front of a liquor cabinet. As we went up the stairs to the second floor, it was even more evident that the house was a victim of old age. The large window in the stair well was broken. And when we climbed up to the third floor, so many panes were missing from the ornate old windows that the pigeons have used it for a shelter. Adams, who is an employee of Johnson Oil Co., has tried to keep the house from “falling down around their ears,” but maintenance on a house that age is a never-ending process. In addition to just maintenance, there is a great deal of restoration that still needs to be done. At one time in the house’s history, it was cut up into apartments. Later, it was used as a care home and more “carving” of space was done. Evidence of the flimsy partitions and heavy coats of paint over varnished woodwork are still seen in the house. The outside, which was in the late Victorian period, was originally wood siding, but at one time or another, someone has applied an asphalt shingle in an imitation of brick. Porches were popular in that day and the Sternberg home had more than its share. Besides the wide front porch, there was one on both the north and south side of the house, and two on the second story. At this time, the house has very little future left. Mrs. Adams admits that if the right offer were made they would probably sell. So there it stands. Dilapidated, decaying but still functioning in the role for which it was built — a home. 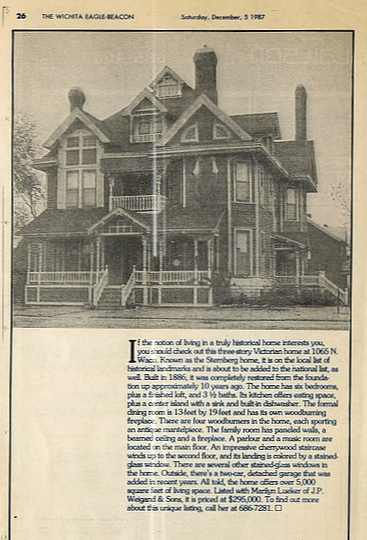 A 1976 article details that the house was to be auctioned. The house finally sold in 1977 for $30,000 to David and Sally Dewey. It took more than three years of controversy, debate and delay, and an estimated $100,000 from various funding scores, but the Sternberg House at 10th and Waco — one of Wichita’s first locally designated landmarks — is ready to reclaim its rightful place as the price of its neighborhood. It will stay a living, functioning, one-family private home rather than be turned into an antiseptic museum, a fate which befalls many landmark structures. It will echo with the growing sounds of a new generation of children, the five of new owners David and Sally Dewey. 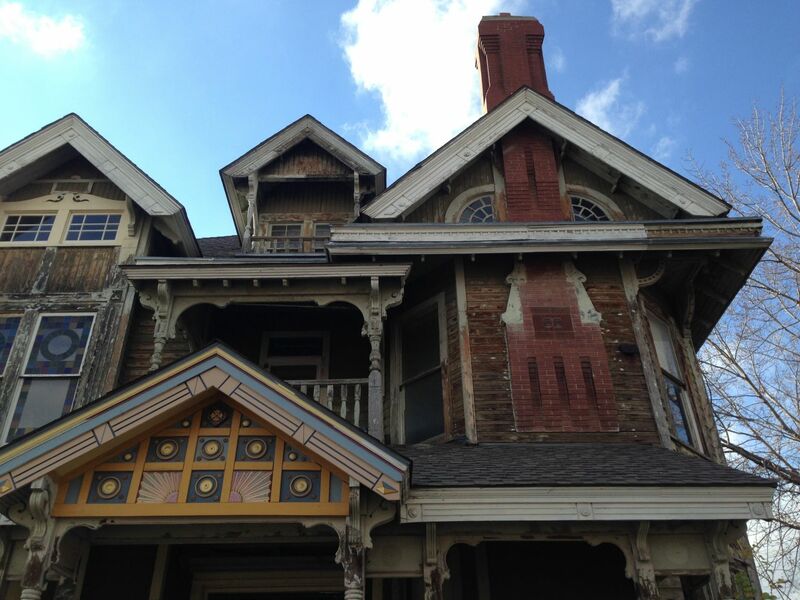 The house, built in 1886, was the first historic restoration project undertaken through the Urban Renewal Agency. URA worked two years outlining the project and restoring the considerable gingerbread exterior of the Queen Anne-style home, and then sold it to the Deweys one year ago this month. Since then, the Deweys have been restoring the three-story wooden structure inside starting from the studs and working out. Next month, the family plans to move in. Today through Sunday, the Deweys will open the as-yet-unfurnished home to the general public for tours to benefit the Victorian Society, a non-profit group seeking to establish a house museum. Hours are 10 a.m. to 8 p.m. today and Saturday and 1 to 6 p.m. Sunday. Admission is $1.75 for adults and $1 for children. The Deweys said this weekend’s tours will be the last general public visits they will allow. 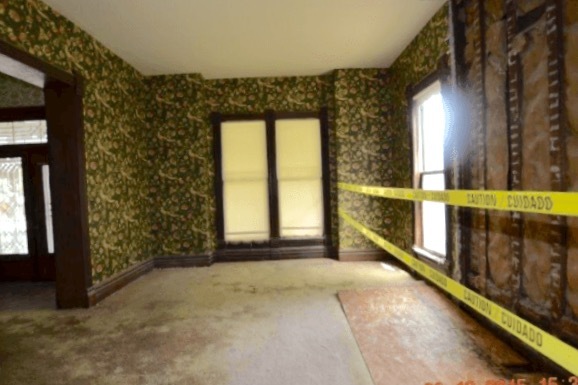 During a preview tour this week, workmen were frantically wallpapering the 10 major rooms on the ground and second floors in colorful floral patterns appropriate for the Victorian era here and reinstalling colored glass panels over the main stair well that had been stolen about three years ago, but recovered undamaged. Some of the details may not be completed by the tour, workmen said, but the scope of the revitalization will be evident. The 4,000-square-foot home, with its wide foyer and huge windows for cross ventilation, displays what Mrs. Dewey described as a “graciousness and spaciousness” not readily seen three years ago when URA rescued it from being a rundown former mansion that had been converted into apartments. False partitions, including several that boxed in the main stairwell, were removed to readmit sunlight to the interior. To the right of the heavy front door is the music room, in which Mrs. Dewey plans to install two antique organs and a piano for continuing the private music lessons she gives. 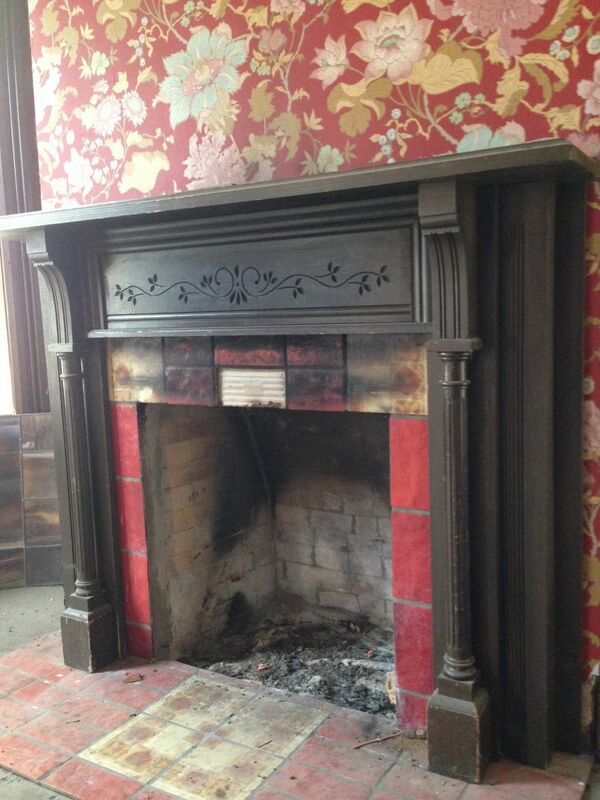 It has a working fireplace with carved wooden mantle and will be papered in floral pattern with dark red background. To the left of the front door is the formal parlor papered in green and gold, carrying the green color scheme of the exterior inside. 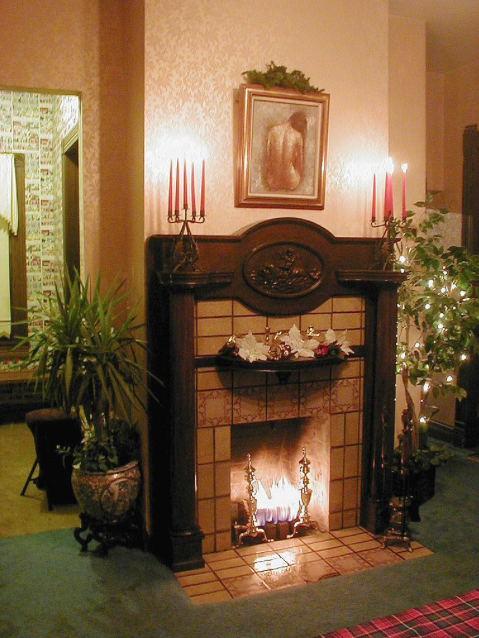 Connecting with the formal parlor, which also has a carved working fireplace, is a second parlor which the Deweys will use as their dining room. 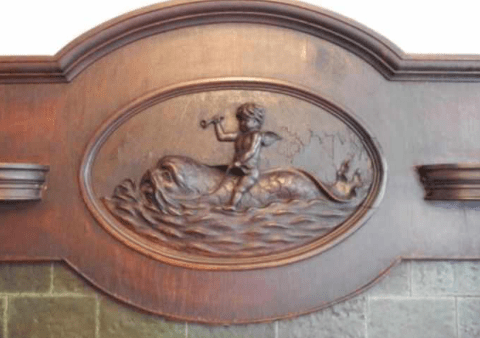 This room has the most elaborately carved fireplace, with an oval medallion of a boy on a dolphin. To the rear of the dining room is the kitchen, which Mrs. Dewey insisted look period but contain all modern appliances. The original dining room, also to the rear across from the kitchen, will be the Deweys family room. One of the largest in the house, it has a beamed ceiling, and a fireplace with wreath motifs. It is also paneled halfway up the 12-foot-high walls and topped with a display plate rail. The second floor, which has no fireplaces, contains five bedrooms. The third floor, originally a pyramidal-shaped attic, has been converted into a bedroom suite for the Dewey’s oldest child, a 20-year-old Wichita State University student. This unique room, which the Deweys note will not be as historically accurate as the first two floors, features a sleeping loft over a sitting room, study room and a stereo room. Outside, the Deweys plan to carry through the historic look of the home with a garden gazebo and appropriate fencing. Also planned are what Mrs. Dewey termed old-fashioned plantings, such as lilacs, roses and honeysuckle. The Deweys are native Wichitans. She said this is the first historical restoration project they have undertaken although her husband, an attorney, joined with an architectural firm to restore a vintage building at 330 N. Main for architectural and law offices. The restored Sternberg, built by early-day contractor and pioneer businessman W. H. Sternberg, commands its neighborhood from its corner lot. Only three years ago it was a dilapidated eyesore. At one time, a local businessman had proposed demolishing it and nearby houses to make way for an apartment complex. The city’s then-new landmark board stepped in and persuaded URA to purchase the house as a historic restoration project under powers legislated in 1972. As the first such local project, URA purchased the home for $12,500 in April of 1975. URA secured an allocation of $32,000 to restore the exterior, but later boosted the amount to $55,000. 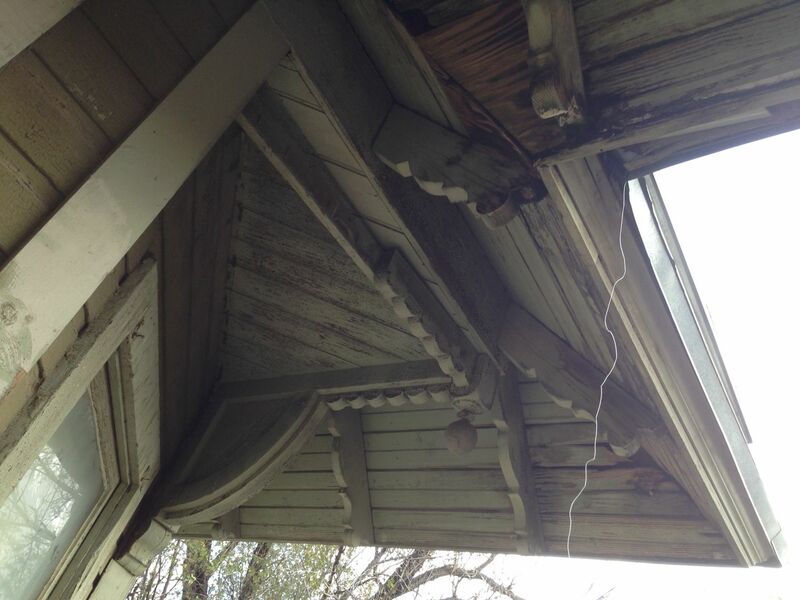 The work involved rebuilding the ornate porches to the style from an early photo, repairing deteriorating siding and repainting it in shades of green to match the original color found from paint chip analysis. 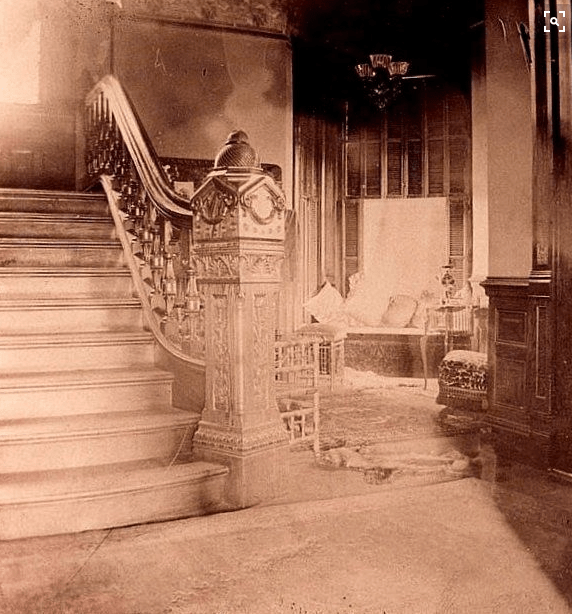 Three months after the project started, thieves broke into the empty house and carefully removed large colored glass windows, the carved newel post of the main stairs and that various wooden mantles. Members of the historical community were outraged and saddened by the historical loss in the $3,500 theft. Four months later the missing items were found carefully wrapped in old blankets and abandoned behind a service station. An anonymous tipster revealed their location. The house also proved to be a source of controversy on the URA board, first because of the additional funding needed and second because of its ultimate use. At first, URA officials did not want it to revert to a one-family private home. Instead, they proposed adaptive commercial use, such as offices. A project oversight committee, with members from both the historical community and various governmental agencies, finally established that it would be returned to its original use. The original sale price was $55,000 to recoup the exterior restoration cost, but no bids were that high for what was essentially a shell. The Deweys submitted a $30,000 bid, which was finally accepted after considerable debate and rebidding. URA conceded it would have to take a loss on the project to keep it underway. The Deweys have been responsible for financing the interior work, but they received help last month when URA approved a larger loan. The original guideline was set at $15,000, but amendments allowed a maximum of $27,000 or $10 per square foot, whichever is greater. A URA spokesman estimated that could mean up to $44,000 for the Sternberg. The total expense will be somewhere around $100,000 for both interior and exterior work. A new home of comparable size without the Victorian frills would cost about $160,000 based on estimates of $38 to $42 per square foot, local Victorian Society members said. 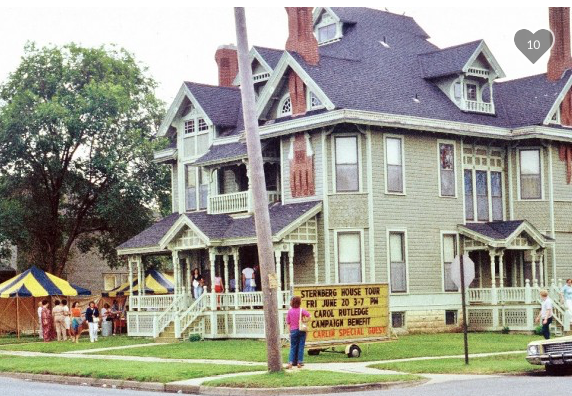 In 1987 the house was offered for $295,000. The historic Sternberg House, a 112-year-old Victorian gem at 1065 N. Waco, has new owners — Hazel and Jim Craig. The couple is making it the home of their Divorce Clinic law office and Craig Detective Agency — and of their family of five. The Craigs purchased the property for an undisclosed amount July 1 and immediately opened shop. The offices occupy the first floor; the family, the top four floors. The couple had long been attracted to the old Queen Anne-style house, said Hazel Craig. 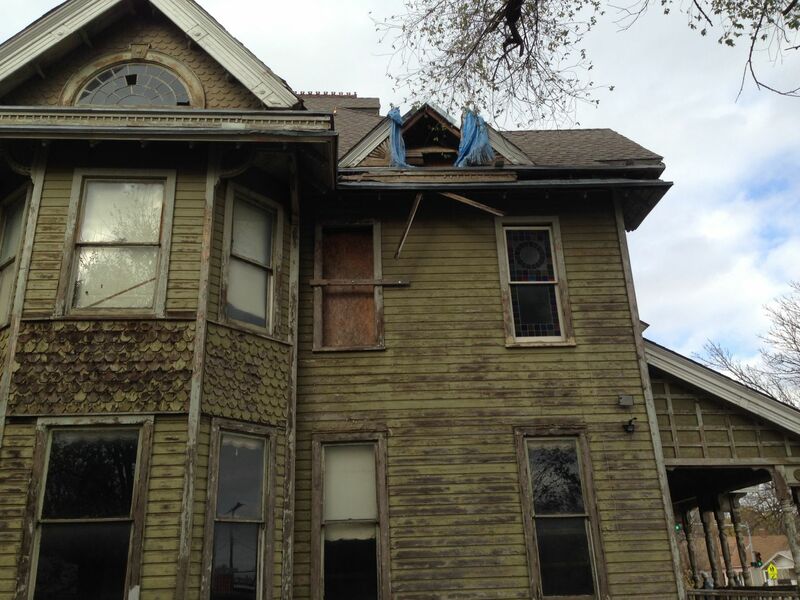 That’s why the Craigs jumped at the chance to work — and live — in the roomy Victorian mansion. In fact, she said, the former owners, David and Sally Dewey, made living in the building a condition of the sale. Built in 1886, the 4,400-square-foot, six-bedroom house was the home of William Sternberg, designer of the historic Sedgwick County Courthouse. The Deweys purchased it in 1978 and restored the home to its original appearance, inside and out. The Craig’s plans for the house include trading the original green Victorian color scheme for a new one, in still-historic shades of blue. It seems incredible that after SO much work since the 1970s, the Sternberg Mansion could once again be derelict. However, while the exterior looks shabby, it is actually in a good condition. The roof is new. There has been a tremendous amount of foundation work done, and the house feels straight and solid. There are no cracks in the walls, or foundation. At least one TALL chimney has been rebuilt. The interior though was…unexpected. And unsettling. I can look past the dust, air of abandonment, and missing bits. What was odd though — so very very odd — was the creeping realization that every bit of interior trim, and every door frame, and perhaps even the entire staircase…was not original to the house. All the trim had clearly been removed at some point. Why? Was it then reinstalled? Or was all the trim removed from the house during its fifty years as an apartment building, and is the current trim salvaged material installed during the late 1970s? I do not know. But surely somebody knows the answer. I hope they will comment on this post. 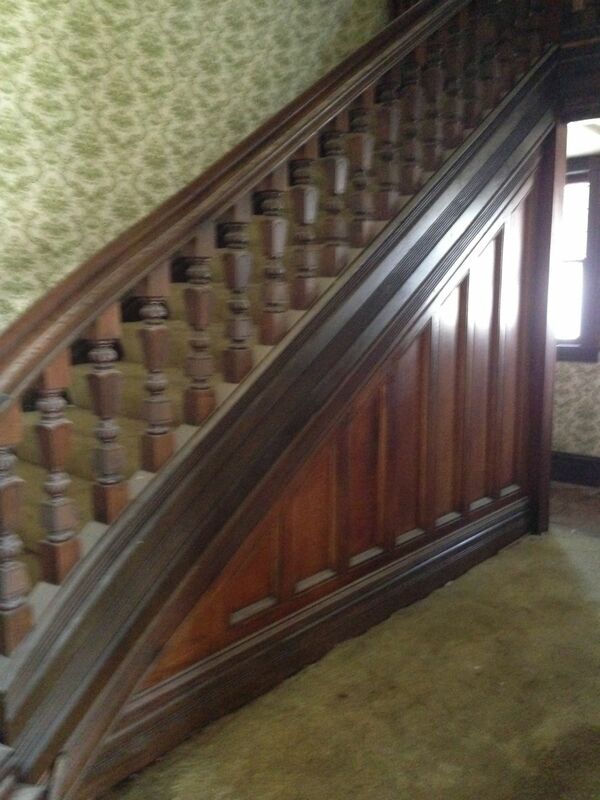 While the stair newel is clearly not original (and what happened to the one stolen in the early 1970s but later found? ), I think, think, the rest of the stair is original. All the flooring is particle board, and this, too, seems from the late 1970s work. The whole house then had wall-to-wall carpeting installed. The kitchen is wholly post-1975. I did not even take a picture of it. Same with the few bathrooms. Two mantles remain. I am uncertain if one is original. The “dolphin” mantle remains, but reports state that it was originally in a different room. Most potential buyers will not even notice all this oddness, so I could not say that any of this matters. The prairie-style stair windows are no longer in place, and the large triple-window is boarded up. The attic level was a pleasant surprise. As noted above, the Dewey family converted this HUGE volume into a finished space. It vaults up way high in the middle, while the edges are all low and inviting and really cool. An open stair was installed to reach the very peak, which has a single room, overlooking the space below. Yep, really cool. There are two second-floor porches. These are a delight. There is large two-story garage, and enough land for a south-facing garden. If I were a potential purchaser, I would only buy the house IF the former carriage house could also be acquired. Can you see the fence? Financially, restoring the house makes no sense. One would never recover their investment. If the house were in a different neighborhood, this would certainly be possible. The neighborhood today is far from what it was in 1886. Of course, I purchased a comparable home and know I will never recover my investment, so I am proof that insane old house nuts do exist. 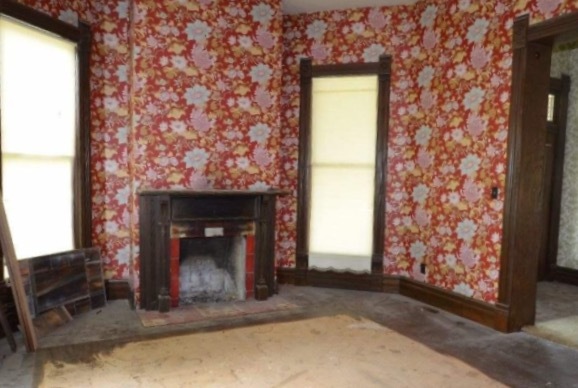 Is such a person out there who could take on this fabulous, historic house? I pray that this house can be saved. The main facade. 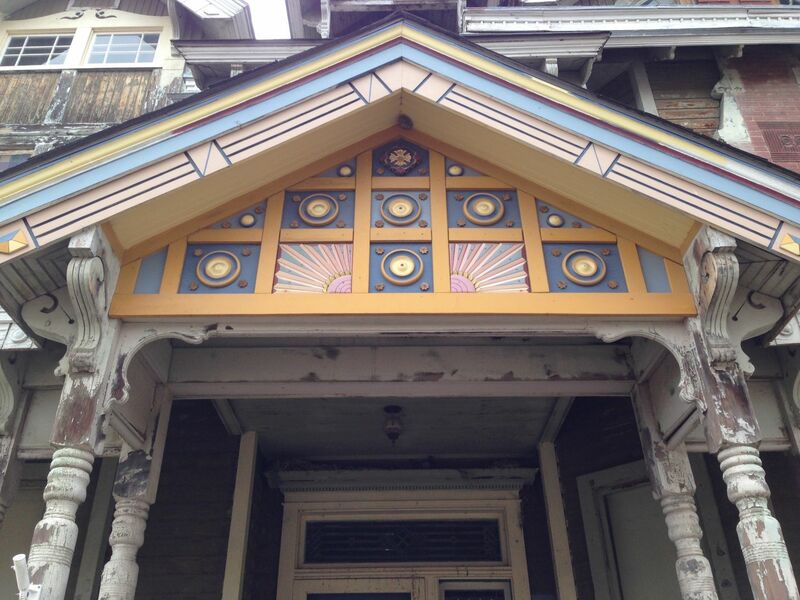 The porch pediment has recently been meticulously restored. All the porches may be from the 1970s exterior restoration. If so, they did a pretty good job. All the eave trim is new. The colorful windows on the second-floor, left, are recent. I would remove the colorful glass. I love how the brick chimneys grow out of the wood walls. Not original, but stunning. I would repaint in period-correct colors. The north porch. The plywood is covering the triple window on the stair landing. The trim under the eaves is to-die-for. 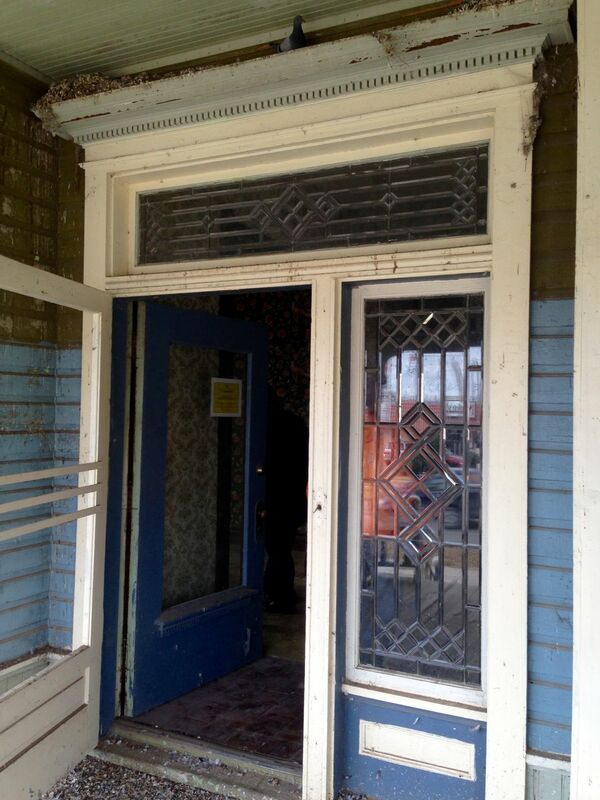 This is the circa-1905 front door arrangement. It seems wholly at odds with the rest of the house. I would recreate the original entrance configuration. Also, you can see how the Craig’s plan to paint the house blue did not advance very far. This is the room just to the right of the front door. And its mantle. I do not know if it is original. It would have certainly had an overmantel. All the tile is post-1975. …this room. Remember the “dolphin” mantle from above? It was later stripped of paint, and this is how it looked circa-1980. The tiles are post-1975. And now. The “dolphin” has been removed. For safekeeping? Or stolen? Here is an identical mantel in another house, thus indicating both were catalog items. And this is what the missing “dolphin” panel looked like. Except the “dolphin” looks more like a sea serpent! I suspect that the walls to each side of the mantle were originally solid. If so, I would recreate this. STAT. The dining room, and with its circa-1905 wood wainscoting and beamed ceiling. The flooring is carpeting. 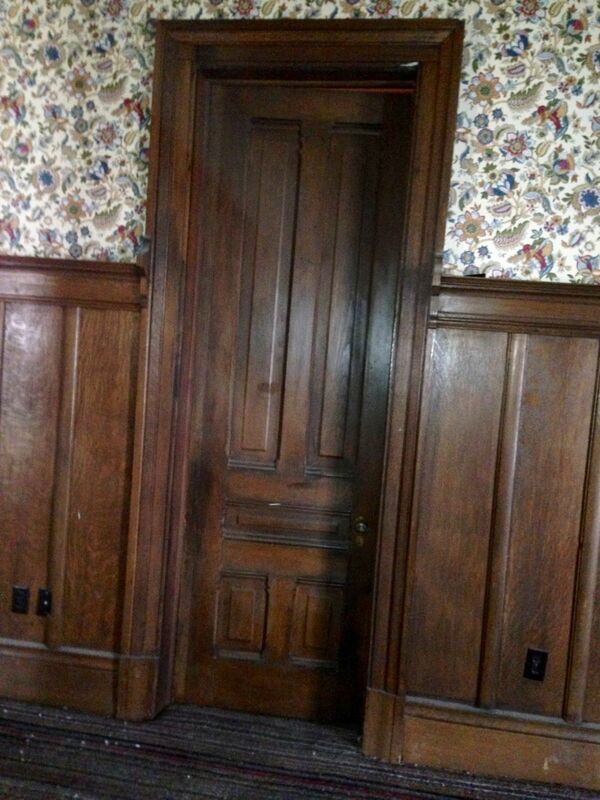 This door leads to a full bathroom, which is certainly not original. Was it the butler’s pantry? You can see how it does not remotely mate with the staircase. Nor is it even of the same wood. This makes me crazy. WHERE is the lost original??????????? The staircase may be original. If so, is is very oddly put together. Perhaps it was partially deconstructed during the apartment years, and put back together? I do not know. It is lovely. 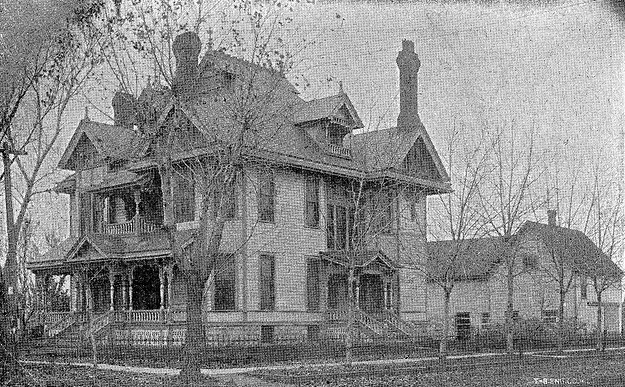 An archival view of the Pratt-Campbell Mansion, extant (1313 North Emporia, Wichita), and designed and built by William Sternberg after the Sternberg Mansion was completed. 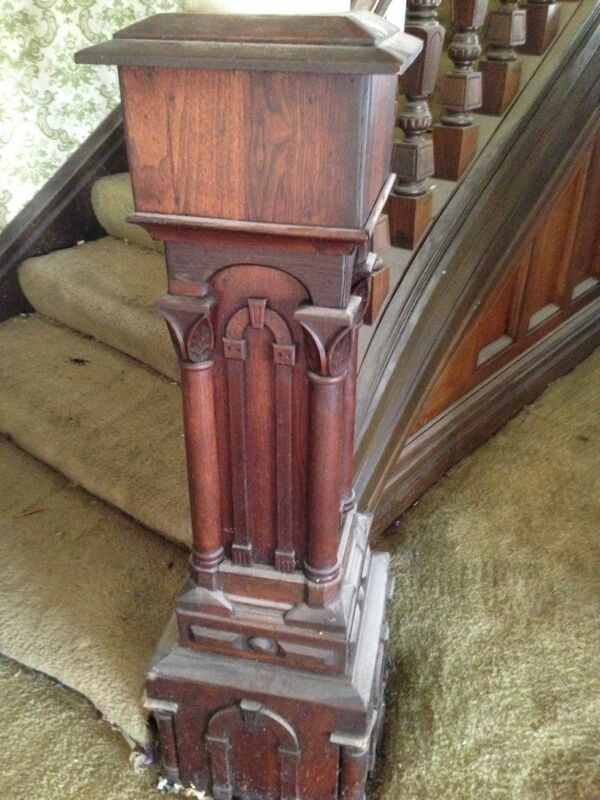 This would be an excellent model to recreate the lost newel in the Sternberg Mansion. Courtesy Wichita-Sedgwick County Historical Museum. The stair is U-shaped, and at the landing was this triple set of circa-1905 prairie-style stained-glass windows. They are no longer extant. I would not miss them. You could not see though them, and their style was, like the front door arrangement, wholly at odds with the house. There has been extensive, and expensive, foundation work completed. 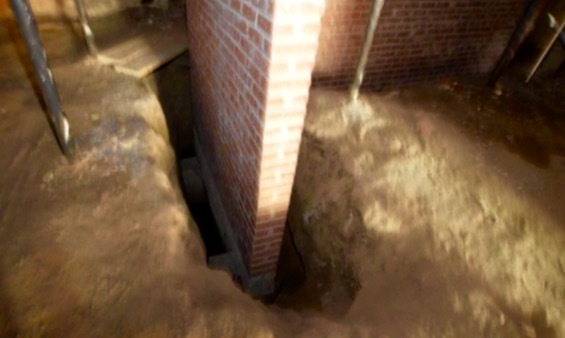 This brick interior support (in the basement) rests on DEEP new footings. To me, the Sternberg Mansion is a poster child for something I have long felt is really wrong with America. For too long, we have been casual and even hostile about protecting our architectural heritage. Yet, money is always found for war. I refuse to accept that a priority for death and carnage is better than a priority for protecting beauty, history, and livable spaces. I also will never understand why a painting can sell for $179 million but great works of art like the Sternberg Mansion go begging. As is true for thousands of fabulous buildings across the land. America has the resources to protect its heritage. We just don’t give a damn. 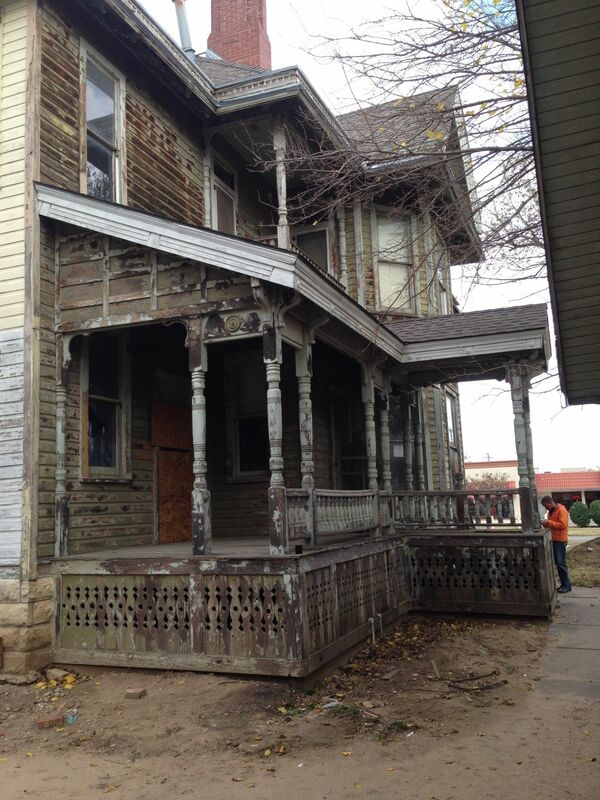 81 Responses to Can This House Be Saved? The Sternberg Mansion. It’s been too long since I left a comment for you to read, but I do read & enjoy every one of your posts. This one – wow – I love this house, and agree 100% with your conclusion. It’s total insanity. I ask a favor, please – I don’t have time to scroll back to your posts on how to remove alligator-ed finish – will you tell me what you use again & process, or provide me with a link explanation – many thanks. Ross, this was such a fantastic read this morning. Your point about why America can spend billions on war and carnage, but be so stingy when it comes to saving our architectural treasures is an idea that has baffled me forever. 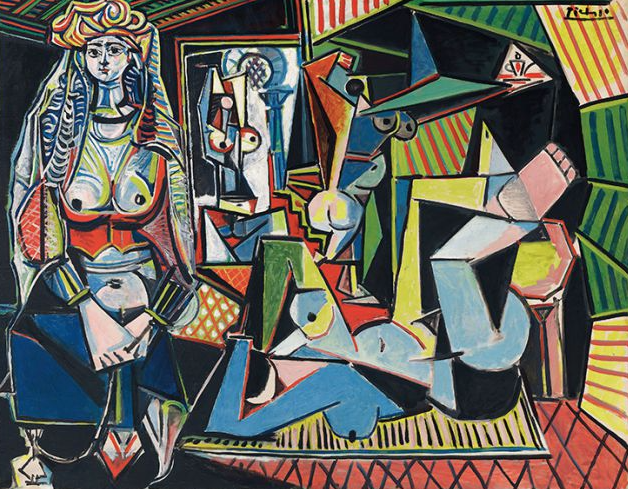 As is the one of spending millions for a painting, but not for a home such as the one you have chronicled. Thank you for keeping the fires burning for preservation’s sake! Every time a Restoring Ross email pops into my inbox, I am delighted. Cora alerted me to the plight of the Sternberg mansion. Ross. Oh, Ross. A man after my own heart. This house has been in the back of my mind since that night I came across it and emailed you. I keep putting off looking it up again, for fear I will find it has been demolished. I feel a sense of guilt that such a magnificent piece of history has been treated with so much disrespect. I’ve always thought old homes had souls, and you can almost feel this one’s sense of shame when you look at it, like a homeless, desperate old soul begging for help on the street. Maybe a letter to the city, or even the Sedgwick County Historical Society would make someone think about saving it? I wonder if Cowtown would take an interest in it? I know it would take a fortune to restore. Then again…59K. Sigh. I am traveling to Kansas at the end of next week and will be staying in Wichita, Emporia and Pittsburg. I plan to drive up Waco street and see Old Lady Sternberg in person. Thank you for caring enough about this poor old soul to take the time to write about her. I agree with every word. Yes, you are obviously a kindred spirit. While the house is but $59K, even if it were $1, it will still take a lot of money to properly restore. I have seen too many wonderful houses taken on by passionate, caring people, but people without the resources/experience to complete the job. The end results are never pretty. I am confident that the Sedgwick County Historical Society is well aware of the house and its latest plight. Indeed, I imagine that all lovers of historic houses in Wichita are aware of the house. A project such as this is huge. Even if the resources can be found to properly restore the house, there is still THE great question to answer: How to protect the house for another century? Unless a valid use for the house can be found that would ensure its long-term maintenance and survival, any efforts to fully and properly restore the house would likely end up being a quixotic effort — as history has already proved. History though does show that a stunningly restored house can be a catalyst for a neighborhood revival. They are restoring old homes in the Wichita State area in hopes of making the neighborhood better, they’re pretty cute ones too. The Holyoake Cottage and the Fairmount Cottage. I may be mistaken, but I believe the newel post(regardless of its authenticity) is wrongly configured. The top block should be on the floor, and switched with the decorative block currently on said floor. Can someone lend me 500 grand? I would love to restore this grande dame to her former majesty. I followed the link from OHD and was thrilled to see this in depth post about this home. Thanks for all you contribute to preservation and restoration, Ross! Someone needs to secure the open spaces to protect children from getting trapped first. It’s winter, I would not worry about painting until spring. Close off all open spaces and openings, then go one room at a time starting with the upper rooms and work downwards, renovate one room at a time for no more than 30 days then work till all of them are finished. It looks nice; don’t let the exterior fool you it is still in very good shape according to what the photos reveal. Hey some of us are nuts, its the easiest thing to say! 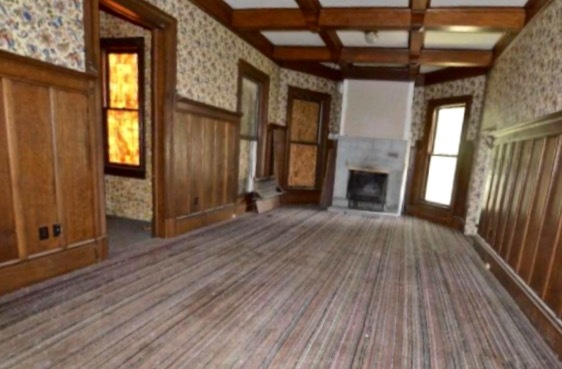 I have always, all my life wanted to restore a Victorian home, I blame it on being addicted to Victory Garden and This Old House when I was a kid. I “thought” I may actually be able to do this, trying to find the positive of a disabling disease, I thought hey with my disability settlement I can buy something and work on it when I can. Well I had a property grab onto me, big time! I thought I would be approved by disability, well I was wrong and three years later I am still waiting. And the property? Well it grabbed onto me!! I was given an offer to buy it for the price of a used honda last week…I almost dropped the phone! Now that we are closing, I am feeling even more nuts…why? Well I bought a property that contains a church and a home! They are simple structures so I have hope! Anyone else who thinks they are nuts, your not! Do like I plan on doing, relocating to the property, get the utilities turning on and repaired temporary. Work on buying some used scaffolding(craigslist is great!) Set it up, climb to the top and start making repairs. Labor is one of the most expensive things when it comes to older properties. As long as your knowledgeable enough and resourceful. Then lets not forget, not wanting the property restored in six months….You can do it! I was just thinking exactly what your last paragraph says. I could totally see myself living in this grand old home. IF I had the patience to restore it! I would love to see pics of the interior when it was first built. Thank you for this much needed post. I know the Dewey family and know how much effort they put into this home, which was beautiful when they lived there. 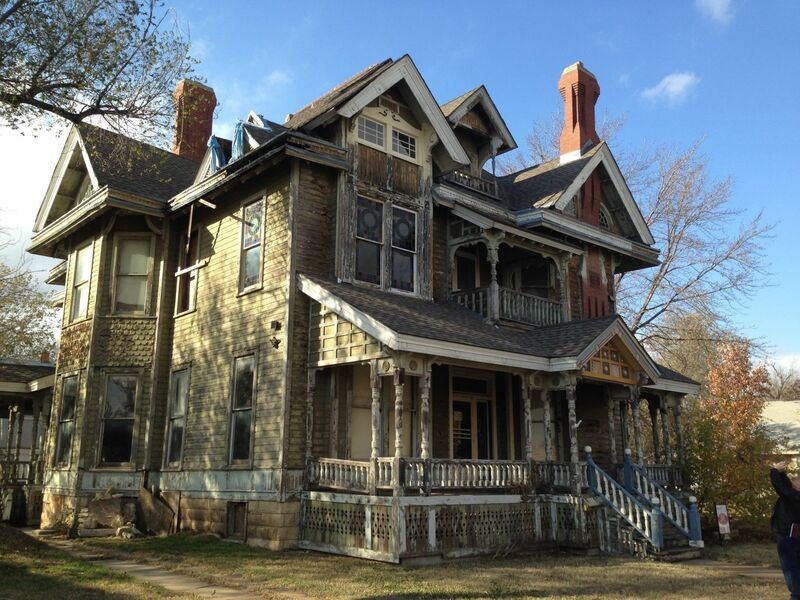 This is one of several homes in Wichita that are begging to be restored and loved. Some things are worth more than their monetary value, and this home is one. 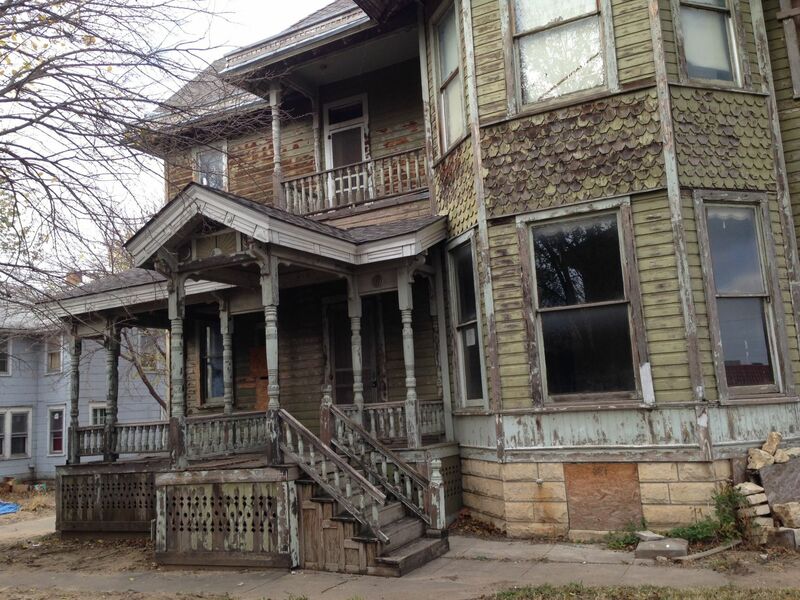 Maybe Nicole Curtis and her “Rehab Addict” show would like to move to the Midwest for awhile. This would be a great project for her, and Wichita LOVES a project. I bet people would be lined up around the block to help with physical labor and donations. I agree with you – there is something wrong with our society that throws money at things that are negative but can’t save the historical and beautiful. 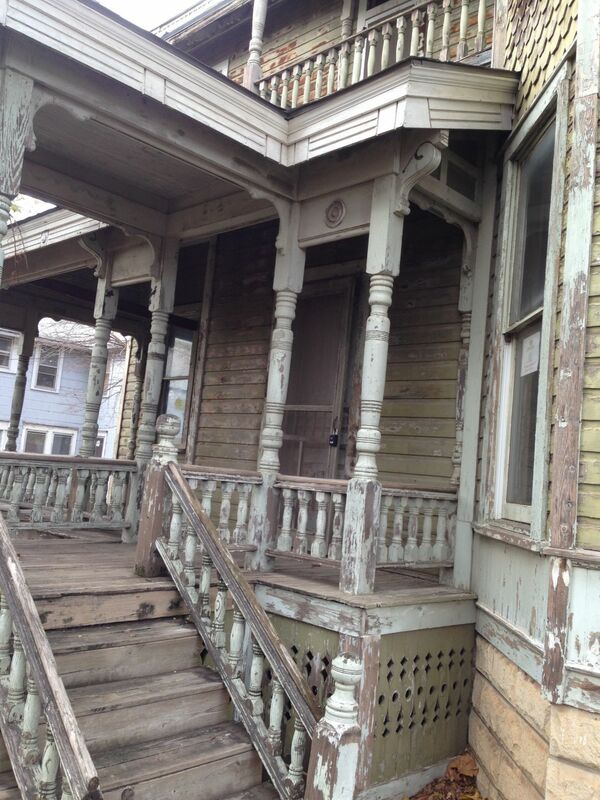 I was also thinking Nicole would be perfect to restore this amazing home. I drive past this wonderful house every day and it hurts my heart. I would love to have the resources to restore it…if only. I only hope that someone rescues her soon. Wish she were in a better part of town also. I remember walking to high school in the ’70’s and watching the house be remodeled. There used to be 3 other mansions just to the south of the Sternberg, two of which my great-grandfather built. They were sold to a guy who said he was going to restore them, and instead he tore them down and built offices. One even had a glass elevator on the outside of the house. My daughter felt “the spirit” of the house calling her as she designed and finished her shoot. She has a partial exhibit as a sculpture assignment at Wichita State University. The school is allowing a full-blown exhibit of her sculpture and photos in Feb 2016. She is hoping to raise awareness for the Sternberg, and even desires to raise funds at her exhibit towards the “salvation” of the Sternberg. She is a fiesty, hopeful 20 year old. If you ever do come to Wichita, you’ll have to give her a shout. Fb site: SuchCreations. It is very nice to meet you! I have a million questions! First though, are you the current owner? I also made an adjustment to the comment posted by Michelle. My family lived in this house for 30 years. I know it very well. I have many old pictures of our rehabilitation. We had the house in beautiful condition before we sold it to the Craig’s. They let it go to pot again. I would be happy to meet with anyone who is interested in buying and restoring it. It will be a money pit, but so is golf, fishing, hunting and any other hobby or sport. Very nice to meet you, David! this is a shame it see this home in this condition I remember when we were younger how beautiful this home was. image your parents have a tear in their eyes when they see how all their hard work was destroyed. Sadly Mr. Dewey is correct. They did let it go to pot. Not out of intention but out of the lack of knowledge. They not only had no idea what kind of upkeep but also did not know the kind of money it would take to do the repairs when something did break. When they moved into it, it was in very nice condition. While they lived there, issues like damage to the fireplace happened. 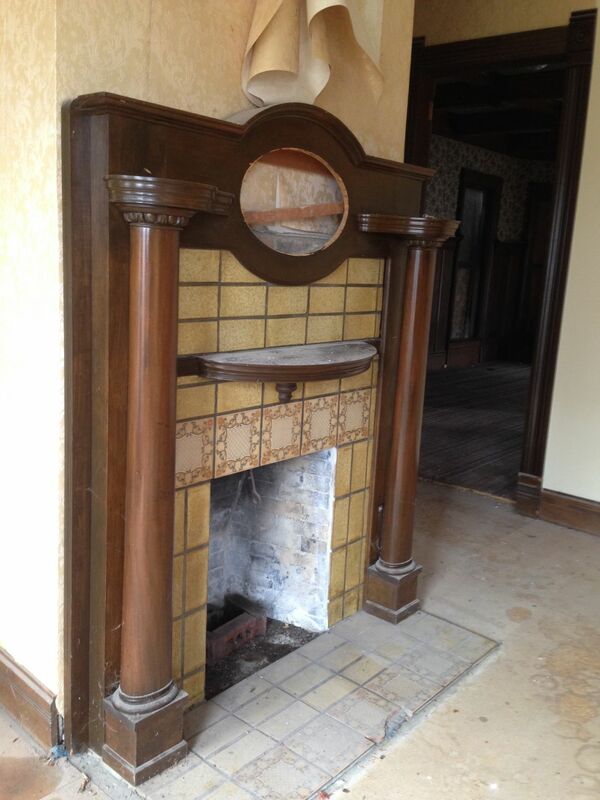 They lacked the knowledge to notice when something like this was wrong and instead would use the fireplaces. This in the end would cause long term damage. While living there they also ended up losing their business (how is not directly relevant) which meant they did not have the money to maintain it. They believed things such as painting the outside could be done by them and not in the proper way. It was a beautiful home. Also in the article you don’t mentio. Things such as the cooling system. It was amazing. This poem sums up my feelings about the neglect of these homes that are a part of our heritage and history. Ross, can you e-mail me? I work with the library and had a question. Thanks! Thank you for writing this. We lived in this house when I was a little girl and I always look at it with positive memories, but I was only eight years old at the time. I don’t live in Kansas anymore but do come back occasionally and I would love to be able to see the inside of this house once more for memories sake. I have contacted Chuck but if you have any idea’s please let me know. I know my children will know of this house and how special it was to me. I hope and pray that one day someone loves it as much as I did and still do. Thank you for your post. I left Wichita some four years ago, and had lost track of the condition of this property. I was the real estate agent who last had the Sternberg House listed for sale. My broker (who had had a long association with the property) and I were very conscious of what was at stake with the sale of the property, and we looked into all possible avenues for conveying its ownership with good results. Without going into the private matters of the Craigs, I will say that they were more complicated than is apparent. Getting the property sold was always a balancing act between the interests of my clients and the interests of the house. (The Craigs understood that.) This made the quality of the buyer doubly important. Even after some screening, many potential buyers looked at the property. We (my broker and I) made every effort to ensure that the condition of the property, its importance, and the work and expense needed on its behalf were understood by everybody who showed interest in and competency for its purchase; we were able to scare off a number of potential buyers who would not have worked out well. Mr. Elliott was interested in the property, researched its history, versed himself in its needs and potential (even, as I understand it, to the extent of creating a plan for its renovation and use as a B and B), was determined to purchase and restore the property, and showed himself to be an excellent prospective purchaser in all respects. Work on the property began soon after its purchase. As I recall (and Mr. Elliott might wish to chime in here), the north chimney– the first major project– needed more extensive restoration than had been apparent from inspections, and the unexpected expense affected subsequent work. 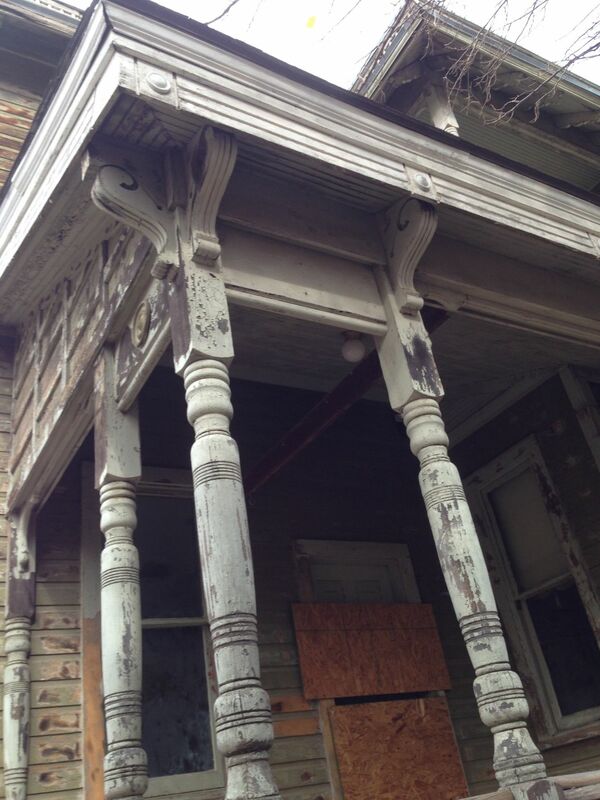 It is unfortunate that stabilization and renovation of the property apparently got away from Mr. Elliott. We shared his hopes and expectations for the property, and are sorry to see the state it has reached. I hope that Mr. Dewey, Mr. Elliott and others formerly involved with the property in various capacities will be able to pool their informational resources for the benefit of the property and a future owner. I might have some useful information about the house in a file somewhere, but I have not yet found it. I will be happy to share any I find. If only we could get a corporation involved. Who and how could they benefit? Could it be the new URA headquarters/venue? My realtor told me last week that an offer has been accepted. Of course, an offer and a closing are two very different things! So, if you are interested I would contact Chuck Bell right away! Thanks for the heads up! Reaching out RIGHT NOW! Hi Eric! Were you able to reach Chuck Bell? I was able to view the Waco House last Tuesday and was informed the fallowing day that it had been sold. Where you able to purchase it? No, sadly I still haven’t heard anything back so I am going to assume I have probably missed the opportunity now. Which crushes me, but I hope somebody secured it who will give the mansion a bright future. I was born in Wichita. Lived near that house for a while, always day dreamed about giving it or a couple others on Waco the love they deserve. I live in San Francisco now and I’m in town for the holidays. I saw the for sale sign as I drove by just yesterday and jumped into action researching. So this dream was born and died all in the past 24 hours. I ALWAYS enjoy your comments on OHD, Ross. This house is amazing. I would love your comments on this house Ross. Wow. Cool. The exterior of course has been made bland with the siding, but the interior retains STUNNING details! That staircase! ZOUNDS! We have grown to love this house even though it is only on the internet. Our hope that our house will see our house sell. While we realize we are not in complete alignment with true preservation, we have a dream of moving an old home to a new homestead location. This was part of my wife’s cancer journey. She is healthy now and we are wanting to have it all….neat old house, open space, farm animals and place for the last kids at home to fall in love with; and then grown kids to come back to. This house has been for sale for two years. We love the staircase, the pocket doors, the floors, the painted lady windows. We are planning a basement as long as new foundation would be in the mix. There are no pics of the kitchen or bathrooms. We are planning new plumbing and wiring as well. 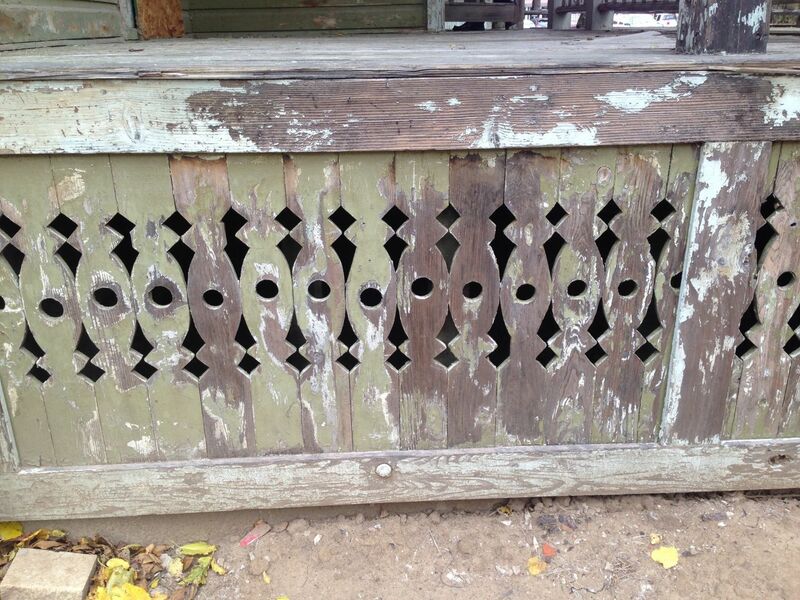 Ross, do you have any examples of what this house’s front porch used to look like? Or any examples of the colors it might have been orginially been painted? I think part of the porch is missing. In the meantime…please pray with us that we get an offer on our house, which is the first step for any of this to happen. I saw the house Christmas week then was notified the next day that it was sold. I recommend contacting Chuck to see if the house is still available. If it is I took a bunch of photo’s all the way to the 4th floor that I wouldn’t mind sharing. I drive past the Sternberg every day on my way to work and have, on two occasions in recent years, let the city’s historic planner know about things such as the second floor being open to the weather because plywood coverings were off the openings. The planner was only able to contact the then-current owners and notify them, of course. As recently as 6 or 7 years ago there were a couple of guys living in the house who had plans to restore it; it was on a mini-tour one weekend. One of the men worked, I thought, for the city. In any event, they disappeared and things went south from there. The Deweys — whom I know — put much toil and money into the place after they bought it. It really was a treasure and they showed it the respect it deserved. I wish our place was up to that level after all the years we’ve owned it! Anyway, the For Sale sign is still up as of January 22, 2016. For Sale sign is gone. Two days ago there were some men looking at the house and the sign was up. Ken Elliott removed the stained glass windows himself with the help of neighbor kids. I happened to speak with a police officer who had been called to the scene. My contractor removed the chimney and gave me an estimate way over $100k to fix the chimneys and foundation. 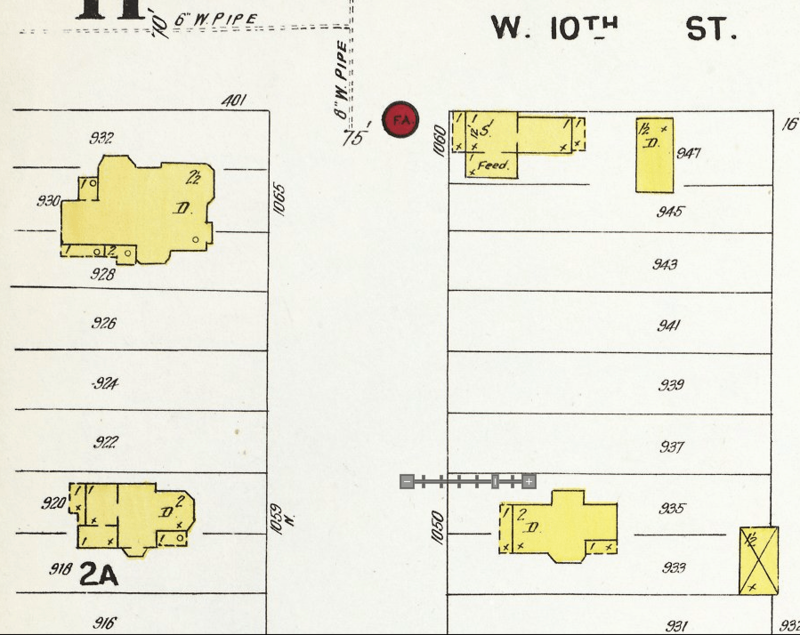 Fortunately I already have a Sternberg house, as well as another historic property, and learned not to attempt this one. I would have snapped it up two years ago. Hopefully it’s sold and the new owners can afford to fix it. Too any of these homes in mid-town are owned by people who can’t maintain them so we have quite a mess. P.S I drove by your house one night. Very impressed by your progress. Ross, I live in Wichita and have long been fascinated with the Sternberg Mansion. I very much enjoyed your article and appreciate you bringing this information to so many people. I am curious, and assume the reason is the structural integrity, but why are there no pictures of the upstairs and bedrooms and attic? Are they, at this time, impossible to access or are they in such disrepair the realtors don’t want them to be seen? Also, I noticed recently the realty sign came down and there were trucks and what looked to be contractors working around the house but it still seems to be listed on all local realty sites. Do you know what the status of it is as of 2016? I do not know the current status of the house. The upper floors are in the same condition as the first floor. They are structurally fine. They just did not get photographed! Updated. House sold to a contractor. He’s poured a new basement. Has just power washed the exterior (yikes) is going to repair exterior wood work, apply two coats oil based primer and a generic coat of paint in beige & grey. Has no plans to restore the inside. Will put it back on the market as is. Glad someones at least stepped up to keep it from demolition. I am glad someone is doing what they can to improve it’s chances of being sold and saved. Thank you for the information. The house should not be power washed. If I remember right, either the Dewey’s or the City had the original paint analyzed and the green color is the original color. Hopefully there will be some research into the color choice. Normally I would not be concerned but is such a big house that it will take a lot to change paint color. I think that most people that would want to buy that house will want to keep it as original as possible- but will be glad to have any color on it rather than see it the way it is. I know I would not want beige and gray as those are not the colors of Victorian houses in Wichita. We did not have the extreme “painted ladies” like some places but the colors were often deep. I know the Winders House that used to be by St. Paul’s Methodist was a medium deep blue. The owner remembered the original colors and was a graphic artist and could pick out the original colors. David Dewey and David Franks both have a lot of information on the Sternberg House. 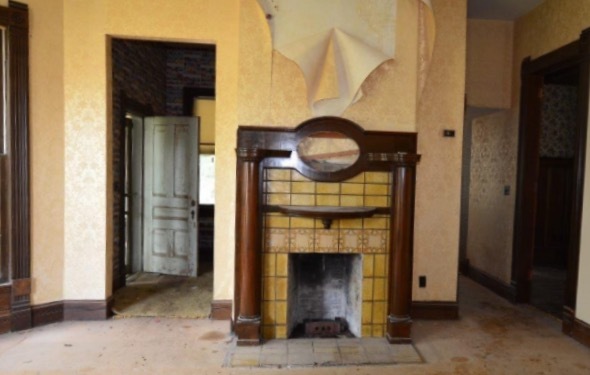 I’m happy that someone’s purchased the old place and trying to do what they can to fix it up, but the contractor (obviously) is not familiar with the Secretary of the Interior’s Standards for Rehabilitation (which apply to the Sternberg Mansion). Those standards specifically state that power-washing wood on properties that are on the National Register of Historic Places is prohibited. The Sternberg Mansion has had a long line of persons who have NOT followed appropriate rehabilitation standards and my hope is kind of like the hippocratic oath, if you can’t do any good . . . at least do no harm. The wood of the structure is protected under federal law. This is personally why I am “thinking” to avoid registering my property. The “tax credits” just don’t seem to worth the headaches of the government stating how to sweep my porch. I think its great they have these laws set into place on these homes, but the fact that they won’t allow me to use a pressure washer on my facade but the city can still order my structure demo’d….Just doesn’t seem right…. 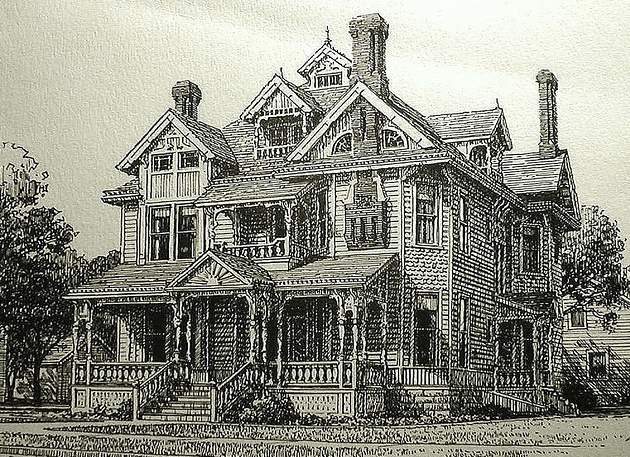 My 1894 house is listed on the National Register of Historic Places. Nonetheless, I can do whatever I want with it. I can lop off the top floor if I want. I can cover the exterior in pink vinyl siding if I want. I can tear out all the original windows and replace them with Home Depot crap if I want. NOTHING prohibits me from doing what I want with my historic house. Its being on the National Register is a sign of recognition, not a rulebook. Same for the Sternberg Mansion. 1) If I alter my historic house too much, its National Register status could be revoked. 2) BECAUSE my house is on the National Register, it qualified for a $90,000 state grant last year. And I can apply again. 3) One cannot do what they want with the exterior of a house in a historic DISTRICT. But the Sternberg Mansion, nor my house, is in a historic district. Jason if you are the current owner of the Sternberg mansion then you should know that the property is already registered . . . . there’s no ability at this point to “avoid registering” it. Question is . 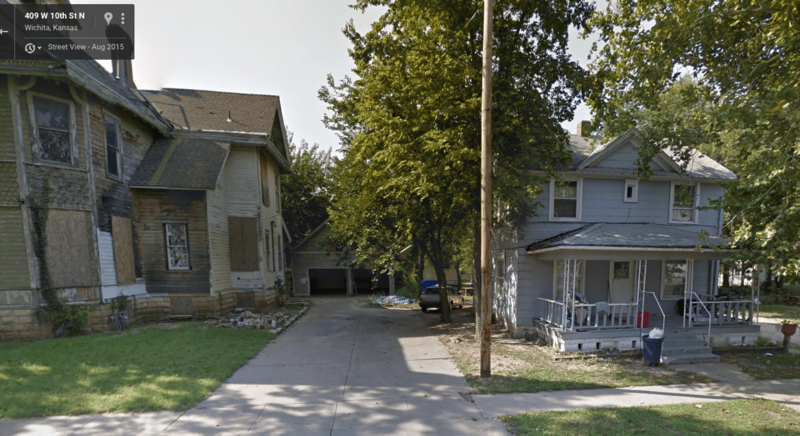 . . what is the property listed on and the answer is: (1) the National Register of Historic Places, (2) the Register of Historic Kansas Places and (30 the Wichita / Sedgwick County Historic Register. Tax credits have nothing to do with the standards of rehabilitation put forth by the Secretary of the Interior (a federal department). Trust me you DO want the tax credits and if you don’t have a thorough understanding of how the tax credits work you should talk to me . . . Been there, done that, know that system real well (and the pit falls). But the fact remains that using a power washer on a historic structure is not only a bad idea but it’s against the law! I have copies of the Standards if you’d like one and it’s really all very easy . . . if a bit unfamiliar initially but all very easy. Just a few notes on your latest comment, Ross. While it’s true that the National listing is not a license for the Park Service to keep you from doing whatever you want to the exterior (“National Register listing places no obligations on private property owners. There are no restrictions on the use, treatment, transfer, or disposition of private property.”), the State Historic Pres Office DOES have the teeth to bust your chops and they do so based on Federal standards about how to treat historic properties. Check it out. You may also have local historic authorities to take into consideration as well. All that said, it was not your National listing that qualified you for State grant money; a listing on the State Register is sufficient; a National listing is often just gilding the lily. And though you are free to re-apply, I wouldn’t put a lot of hope in getting a repeat grant anytime soon, It may have happened but the KHPO does not, in practice, give a second grant to a property unless some very special conditions pertain (being too broke to do the work on your own doesn’t count!). Don’t surrender all hope, but don’t assume you can get another grant as easily (LOL) as the first one. We are in agreement that being on the National Register is not a straight-jacket. We disagree that the state is an automatic straight-jacket. Just because my house is on the National Register does not give the state the right to tell me what to do. IF my house were in a state historic district, my house would, as stated above, be subject to X restrictions by the state and city. But my house is not in a historic district. NOTE: Now that I have received a Heritage Grant, my house IS subject to some restrictions (meaning that all grant work must comply with the Secretary of the Interior’s Standards). I am only too happy to satisfy these restrictions. Indeed, even without the grant I would default to Doing It Right. NOTE: I am all for historic restrictions. My reason for discussing the issue is that I dislike the many incorrect assumptions regarding the responsibility of owning a historic structure. I always cringe when I read: “I don’t want somebody telling me what to do.” In my long experience, the people who state as such almost always do damaging things to their historic property. Over a century of home building, things have changed for the better and somethings can be upgraded on a historical building…but alot of the snowballs that come along with registering/tax credits/grants won’t allow this.. Both my structures, have clapboard….both have a combination of ceder, pine and redwood….how do I prove which is original? Ever side of both buildings will need new siding…The original has no sheathing or building wrap…I wouldn’t be able to “upgrade”…..
All the trim on both structures has been shaved off by the installation of fo siding…There is absolutely zero history on this place….How do I prove what was there? Would you agree that my words almost always invoke a different meaning than had I written just simply always? I do not believe this is true. The Secretary of the Interior’s Standards strongly encourage making historic buildings more energy-efficient. As does the state of Kansas. Indeed, I know of no preservation body which does not encourage same. I am partially reroofing the Cross House with asphalt shingles. This is within the Secretary of the Interior’s Standards, and was OK with the state, even though the long-lost original roofing was wood shingles. The asphalt roofing could, at a later date, be removed with no damage to the house, and replaced with wood shingles if a later owner so desired. 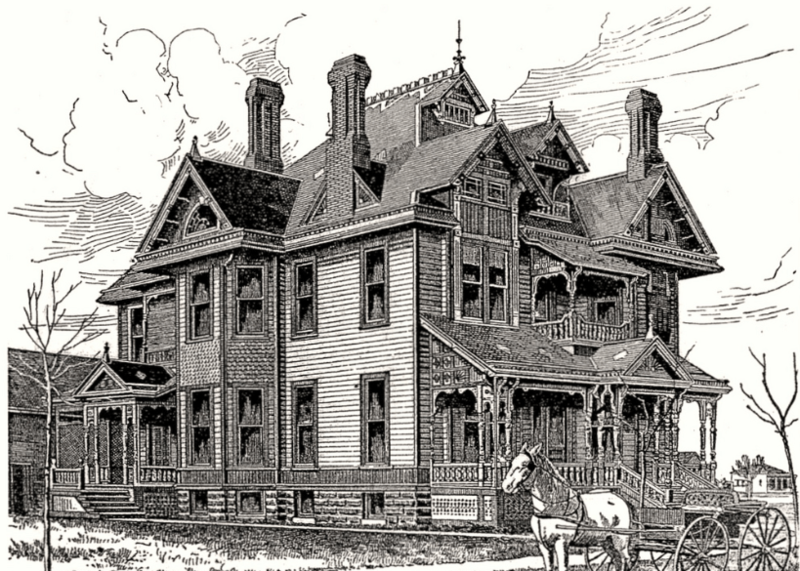 The historic Brooke Mansion by Frank Furness was reroofed with asphalt shingles. I also know a house by Frank Lloyd Wright which was reroofed with newfangled recycled aluminum which looks sorta kinda somewhat like cedar shakes. This was also approved. The house. The Cross House is partially covered in cedar lapsiding. In the few areas this is missing I am replacing it with cement siding (over a new vapor barrier) which looks, once painted, just like the original cedar siding. But it will last forever. And this, too, has proved no issue. I am replacing most of the sill of the house. I will be using pressure-treated lumber, which did not exist in 1894. This change was not only approved, but strongly encouraged. I believe the state CAN tell you what to do. Now that you have their money for your project, you are obligated to adhere to the plan for which you were given the grant. Sounds to me like a straight-jacket, albeit it one grantees enter into of their own accord (as I did in 1994 when my property received a large grant for roof restoration). That you have a Nationally-listed property is irrelevant beyond giving you grounds on which to apply; Kansas gave you the money; Washington did not. You make a good point on the issue of public perception about restrictions; I’m often confronted by folks who ask about what color I can paint my sash, etc. There’s not much Wichita regs say about color beyond “We hope you don’t use Day-Glo orange” but the city does get testy if you try to cover brick with vinyl. Now, up in Portland OR, where my sister lives, the city DOES have requirements about the paint scheme. Her Nationally-listed home had to go through the process of having all the colors approved — but the trade-off was the Oregon Special Assessment Program, which freezes property tax at the pre-rehab value for a 15-year period! The property tax on my sister’s 1894 home is about $900 a year …. on a house now valued (post-rehab) at close to $600K. Anyway, the Kansas program is a pretty good one on the whole, and it has made possible the saving of a great many structures. I stated several times above that Kansas CAN now tell me what to do with my house. This however only applies to the Heritage Grant, and I embrace the restrictions. Having the Cross House on the National Register is hardly irrelevant. First, it gives me satisfaction. Two, it allowed me to apply for the Heritage Grant. Three, the city of Emporia exempts the Cross House from certain codes because the house is on the National Register. For example, I can restore the original LOW railings on the porch, rather than install those horrid HIGH railings which are now code mandated. I’ve seen those high railings mandated by some cities. Really hideous. This Old House worked on a place (The Belmont Victorian House), where they installed a steel cable above the “swooping handrail” to meet city code minimum height. Surely they could have waived the requirement! No longer can anyone sit on the railing and enjoy the afternoon. A pox on (certain) city codes! I grew up and went to school with the “Dewey” kids. Went to many Slumber parties at this house! It was beautiful when they owned it! And Sally Dewey was always such a sweet and proud hostess when you were visiting. So sad to see it looking like this now. I really hope someone can save it and restore it to how beautiful it once was. Ruined by power washing. The Sternberg has the texture of a grated carrot now. Most of the paint was gone, all it needed was a touch of sanding. It’s getting the contractor special make-over. You can see every mark on that house. They didn’t even both to sand any of it. Now the work to restore the house has tripled. Though who knows since he painted it right after power washing, between rain storms and the humidity was at like 90% I’d say the paint should start peeling off in sheets within a year. So sad to see the city not purchase the house and restore it’s little remaining history. Instead we get three dozen bronze statues of people downtown to give the illusion it’s habitated. I noticed it had a coat of something on it. Anyone know if that color is primer or is that an actual paint? They left the north and east porch décor as it was and the stained windows were intact. The others were boarded or all together missing but it looks like they are doing some serious work on it at this time. Seems that muddy swamp color might be it. In the back you can see he’s testing navy and maroon as accent trim colors. Not all together inspiring. Muddy swamp describes it perfectly and yes, if that is it – that will be tragic. The original Sternberg green was validated by paint testing done by David Dewey. It was said to be the color of grass left under a cobblestone- a yellowy green. If we remember right, it was not the Dewey’s favorite color but it was original and documented as such. Paint color can be changed. Sorry to hear the siding is being abused. We are so relieved to see scaffolding and not bull-dozers. I honestly believe (despite the widespread believe that the green was original) that the original color was a cream / butter. I have several reasons for believing this . . . one is, the original carriage house (underneath the asbestos siding) has the EXACT SAME SIDING AS THE MAIN HOUSE DOES (high-quality pine that really is so hard it won’t take a regular iron nail). The original paint color is still on the Carriage house and the asbestos siding has preserved the wood and paint in really good condition. In 1886, the main house and the carriage house would have (without question) been painted the same color and in the same manner as the main house and there is absolutely NO green paint on the original carriage house (look underneath the asbestos siding). Also, I have pre-1900 photos of the structure showing that it’s not green (it’s black and white, but the base color is too light to have been the avacado green it is now). It’s possible that the house was originally green in 1886 and then repainted 10 years later into a lighter color, but unlikely. The grand lady has had a number of paint jobs (and other exterior coatings) on it over the years. but if I were going to place my money on either cream or avacado green, I would go with the cream spot. Glad to see that this has come to your attention and that you weighed in. The asbestos siding on the carriage house likely dates from the 1950s. Houses are normally repainted every ten years. So, the carriage house would likely have six coats (or more) of paint by 1950. Thus, the top coat colors under the asbestos siding would not likely be original, but from the 1940s. The dating of the asbestos siding could be correct and you’re probably right that the topcoat under the siding would not be the original color. But, just ten years life from the paint? I suppose if someone got tired of a color they might have repainted but oil-based paints had a life much longer than that (especially when lead was still legal!). I still use oil base on all my houses and can guarantee 20-25 years with proper prep work and no underlying issues that would compromise the work. Of course, few people want to pay $30-40K for a paint job these days, even if it means they will probably move or die before the house needs repainting. Note my use of the word normally! I restored a house for a client ten years ago which was built about 1915. It had two coats of paint! My current house? I have lived in it 21 years, and only fully painted it once. However, I am constantly spot-painting areas. Paint on the south side of a house will require painting way sooner than the north side. In short, I agree that there are no absolutes. Hence normally! Thank you for your post. My husband and I live in an older home that we have been restoring. We stopped in the area to have some dinner and saw this beauty across the street. After Googling the address I came across your post. It’s a stunning property. As of today it still has that primer gray color. There’s a large lift in the backyard and fences around the porch to keep people from entering. Outside of that it doesn’t look like anything new has been done. There are a couple of pretty Victorians down the street. Hopefully somebody can do something with this place. Glad I came across the site and fourm. When the Deweys acquired the home and did the huge remodel I laid all the carpet in the home and have been shocked to see how time has taken it back to the condition it is in today. Gawd…some of the carpet I laid appears to still be down looking at those pics. If my memory serves we started on the install on or about July 3rd,1978,all the carpet came from Star Lumber. We worked on and off in the home as areas were made ready and then went back much later–at least into 1979 and laid carpet in the attic. I was working in the area about a year ago and grabbed some lunch and went over parked on 10th street to eat and to just look it over. All my mind could see was the condition it was in when I showed up to work there in 1978,not what you see today. Wow. Great story. Thank you. David. I was the guy frantically getting those areas ready. Mom got tired of waiting and scheduled you guys to lay carpet, even though we weren’t ready. We worked around the clock. Jeff,are you the Dewey’s son or sons? When did we do the attic–was it the first part of 1979 or was it even a year or so later? I can still remember an Eagle article for years later where one of you were sleeping outside way up on that small porch above the front door in a hammock. It’s sad to see how the house has gone back downhill but I’m sure that’s what they were saying before your family got it and made it look great. Yes, I am the oldest. I was 19 when we started this project in 1977. My frat brothers and I did a lot of the work. I think you carpeted the fist and second floors in the summer of 1978, then the attic that fall. My brother Ben was the one in the hammock. Thanks Jeff,are you still in Wichita and go by the house every so often? I was down that way and went by a couple of days ago. The owner put up a small fence around the entry on the north side,must be having problems. It’s amazing how time reclaims these homes. I only saw your dad once I think when we were there but your mom was there each time. If she was worn out from all the work she never showed it when we were there,so,so nice to us and I’m sure all the workers. Agreed. I completely agree. Thanks for making this post! Such a beautiful home…. Ross, I have a number of photos of the 1977-78 restoration, including before and after shots. You are welcome to review and post some, if you want to. My grandparent beautiful home! I just went on a tour of it yesterday! Got to stand in my mothers old bed room (sarah dewey-beck) wow i was 6 months old last time i was in that house now im 25 sad to see 24 years ruined that beautiful home if the area wasnt so rough it would make a nice home! Id love to see it back in its glory days again! Despite a Historical grant awarded to the current owner nothing has been done in a year and a half. The tarp over the giant hole in the roof where the chimney once stood has rotted away and the house interiors are completely exposed to rain and snow. Many exterior windows have been broken and the entire house appears in worse condition than when the previous owner had it. It’s creating a blight on the neighborhood and if the current owner doesn’t step up to the plate the structure will be demolished. I foresaw this when I heard a “contractor” aquired the property, they are birds of a feather.